Menudex software makes calling, skyping and emailing your outlook contacts a very quick task. Menudex puts all of your Microsoft Outlook contacts in a menu always available on the taskbar. There’s no need to even open Outlook. Just use Menudex click to call your Outlook contacts. Without Menudex, Outlook users would need to open Outlook, click contacts, click search, enter the name of the contact, and click the search button, locate the contact, open the contact, copy the phone number, open the softphone, paste the number into the softphone and finally click dial. The alternative was to import your Outlook Contacts into the softphone every single time a new contact was added. Menudex changes all that. Menudex is always immediately available from the systems status bar no matter what program you are in. Click the Menudex icon and a menu of letters A to Z appears. Select the initial letter of the contact, then a sub menu appears showing all contacts with that initial. Select the contact, select mobile and click. Menudex will now activate the softphone with the mobile number of the contact. Other selections for the contact could have been home number, or work number. Menudex can also commence skype calls from the same menu. Menudex will even start new emails to the selected contact with the email address prefilled and the first line in the email body as “Hi <first name>” with the contacts first name. Users are able to configure Menudex with whatever first line of the email they would like such as “Dear”, or “Hello”. Menudex will also integrate with your SMS application. 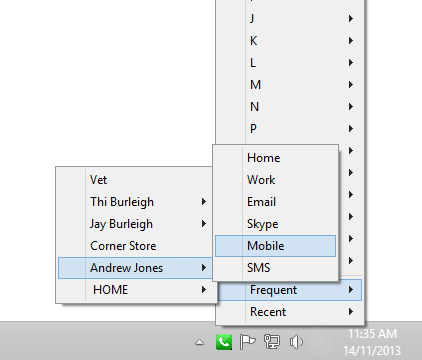 One click will SMS your Outlook contacts, all from the same menu. Menudex provides seamless integration with Microsoft Outlook. Menudex can update the contacts from outlook either automatically on startup, or manually. You never have to import your contacts to your softphone. This way Menudex will never create duplicate contacts. Menudex can be downloaded from www.menudex.com.au. It comes with a thirty day trial and a money back guarantee. Menudex requires a softphone. We recommend X-lite from Bria. January 31, 2015 in Communications.